"A half finished book is, after all, a half finished love affair"
I´m a little bit fed up with gothic horror novels. 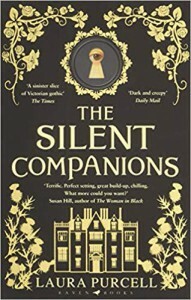 The Silent Companions is another one of these lackluster attempts at writing an atmospheric, creepy and scary book and doesn´t hit the mark on any of these three things. Add to this a main character, who I disliked from the very first page and an ending, which didn´t make any sense at all. And I would really appreciate if an author gives a more sophisticated reason for a malicious spirit being evil. In this book it basically boils down to "The ghost is evil because the person in real life has been evil". No explanation whatsoever why said person is evil and above all, what was the objective of this ghost. Why did it do all the things it did? I get it, it´s a "devils spawn" kind of plot. I was so bored by all of it. Since this book wasn´t scary at all, I´m not batting an eyelash at putting out the lights tonight. On to the next read.